Jim Quigley was a champion of community development; a larger than life personality who was a dreamer and a doer; an idealist and an activist. Jim was born in 1942 and grew up in Toomevara, County Tipperary. He attended school firstly in Nenagh and then Mungret College, Limerick. He spent two years in the SMA Seminary, Cork before moving to Dublin where he worked initially in the bar trade and subsequently in sales, with Telecom Eireann. In 1970, Jim married Brigid Carolan and shortly afterwards the couple came to live in Skerries, purchasing their home in the newly built Hillside Estate. An Irish Times obituary in honour of Jim, published shortly after his death in August 2001, refers to the ‘missionary zeal’ with which he approached his involvement in community development. In this, Jim was inspired and influenced by the movement, Muintir na Tire, founded by Canon John Hayes in Thurles, County Tipperary, in 1937. Self-help, neighbourliness, service for the common good are the core principles of Muintir na Tire and Skerries provided ample opportunity for Jim’s energy and commitment to these goals. Jim firstly volunteered in his local Residents Group and from there was drawn to the Skerries Development and Community Association where his involvement lasted 22 years. Jim was Chairperson of the SDCA for ten of those years and worked on many, many projects. Perhaps the most visible legacy of his work in Skerries is the Community Centre. In 1977, the Skerries Development and Community Association set up a sub-committee to look at the needs of their fast-growing town. 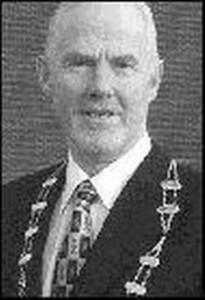 Jim was a leading member of this sub-committee which lobbied central government; the local authority, then Dublin County Council and the residents of Skerries to raise the necessary funds to build a Community Centre. The Centre opened in December 1982 and Jim was determined that it would succeed and flourish. He kept a keen eye on income streams including the Saturday evening bingo event where he was a regular presence. In the course of encouraging his own children Orla and Edel, Jim became involved in community games at local and national level and served as chairman of Skerries Athletic Club. In the early 1990s, the SDCA was asked to collaborate with the County Council in the development of Ardgillan Castle as a visitor attraction. Jim became Chairman of the Board of Management and attended meeting after meeting as this project got off the ground. The same can be said of his involvement with Fingal Tourism, formed in 1994 to coincide with the new Fingal County Council. The opportunity to take early retirement from Telecom Eireann allowed Jim to pursue his ideals for community development and to commit his energies to this area which was so important to him. He had rekindled his links to Muintir na Tire in their Golden Jubilee year of 1987 and in 1994 was elected the organisation’s first full-time President. As with every other project, Jim threw himself into the work; travelling up and down the country; establishing Community Alert units; lobbying and advocating on behalf of vulnerable people and communities. He became a member of the Rural Development Strategy Group; was a member of a steering committee for a White Paper on ‘Voluntary Activity and its relationship to the State’; in 1999, he was nominated to the National Crime Forum by John O’Donoghue TD Minister for Justice, Equality and Law Reform. Jim was named Tipperary Man of the Year in 1999, an accolade he treasured as he dealt with the onset and diagnosis of a brain tumour. Jim died on the 29 August 2001. We remember him and celebrate his life’s work with an annual award. Once a year, at its Annual General Meeting, the SCA announces the winner of the Jim Quigley Award for volunteers, which in a 3-year rotation is given to an individual volunteer, to a voluntary group, or to a young volunteer. The 2017 Jim Quigley Award for Voluntary Group of the Year went to Skerries Water Safety.